Elizabeth Slayton, a painter based in Jamaica Plain, has, over a number of years, consistently produced carefully wrought and gently inspired paintings in a variety of motifs. 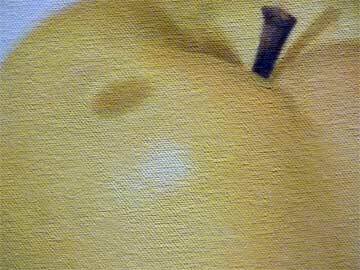 This show features, dominantly, a group of sedately inspiring still lifes. 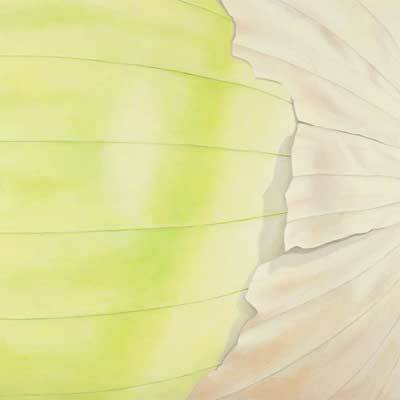 Most of the paintings have relatively few elements – a couple of pears, a few apples, a single onion – but the rendering is exquisitely detailed. 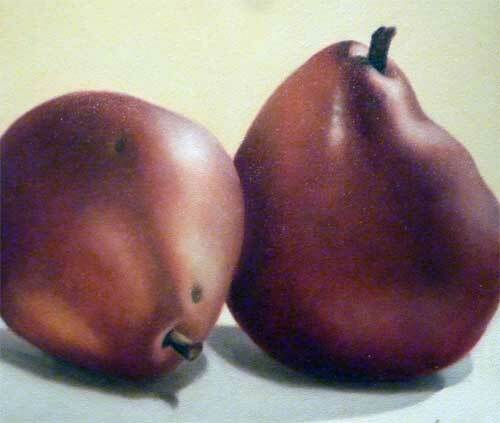 These works are realistic, but they have a softer quality than do many of the works by contemporary painters who typically fit the hyperrealistic mold. Hyperrealists typically provide, with sharp detail and hard edges, representation that comes with a smirk. They frequently suggest, in that extremity of detail, a satirical stance on the seemingly gratuitous act of exact reproduction in the age of photography. Slayton’s paintings, on the other hand, do not smirk; they smile warmly and gently, showing careful attention to qualities of surface and light. Their delicacy of detail reflects a subtle but persuasive meditative pause between object and rendition. That pause confirms the mediated and delicately shaped result, without need for a grin. That subtlety of intermediation is the open secret, not easily mastered, that all great representational artists share. Starkly unfelt renditions lie on either side of the knife edge upon along which the capable representationalist cautiously proceeds. Slayton glides along that edge with a balanced deftness. The show includes fifteen or twenty different canvases. Here are some reflections on a few of them. 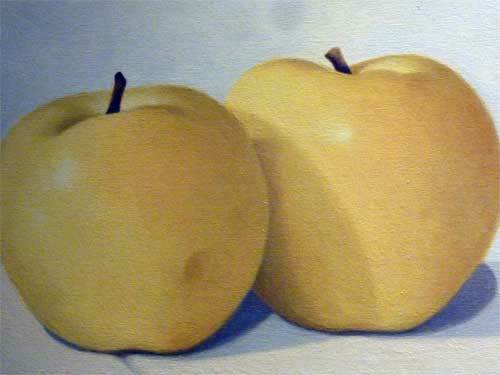 Three simple yellow apples. The left two touch; the third is apart, showing a slight bruise. Several layers of bluish grey shadows spread across the cream colored counter surface. A single fissure represents a break in the tiles. A small hint of reflected light appears on the surface of each apple, and with it, there is an equivalent hint of reddening. The background shimmers with a subtle kind of polychrome. 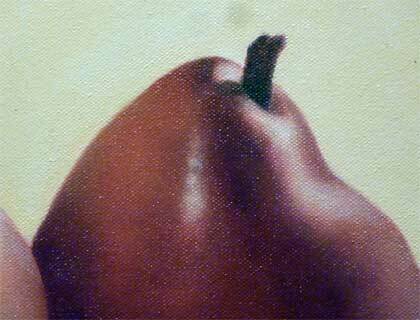 Each apple has a brown stem, clearly demarcated from the background and the apples. One then sees the cream colored counter is also polychromatic. How many layers of shadow intersect the three! One is on its side, one erect. The one on its side has two small defects in its skin. The erect one has a deformation in shape near its stem. The red moves from deep to light. The yellow surface radiates behind. Small triangles of background peek out from the junctures. How independent, yet closely related, these two are. The shadow overlap and intersect. Two very different highlights embellish the rightmost pear. The wall and table appear continuous, unbroken by lines, but are shaded slightly differently, the wall darker.